(Vatican Radio) Pope Francis held his weekly General Audience on Wednesday – the Wednesday of Holy Week or “Spy Wednesday” as it is called in many parts of the English-speaking world. The Gospel reading of the day recounts Judas’ betrayal of Jesus, which sets in motion the events of Christ’s Passion, Death and Resurrection. In his catechetical remarks to pilgrims and tourists gathered in St. Peter’s Square under a brilliant blue April sky, with a crisp spring breeze blowing through the city, Pope Francis spoke of Christ’s free embrace of suffering and death, which he took on for our sake. It was a theme to which he returned in the English-language remarks that were read out following the main catechesis in Italian. As Saint Paul says, “he emptied himself… and became obedient unto death, even death on a cross” (Phil 2:7-8). As we contemplate Jesus in his passion, we see reflected the sufferings of all humanity and we discover God’s answer to the mystery of evil, suffering and death. He gives us his Son, who dies humiliated, betrayed, abandoned and reviled. Yet God’s victory shines forth in what appears, in human terms, to be failure and defeat. The Holy Father’s English remarks went on to say that Jesus’ passion is the culmination of his revelation of the Father’s infinite love and his summons to faith in his word. Christ takes upon himself the power of evil in order to set us free: “by his wounds we have been healed” (cf. 1 Pet 2:24). This week, as we follow Jesus along the way of the cross, may we imitate his loving obedience to the will of the Father, especially in times of difficulty and humiliation, and open our hearts to his gifts of reconciliation, redemption and new life. There were several groups of English-speaking pilgrims in the crowd, from countries including England, Australia, Canada and the United States, for whom the Holy Father had greetings. Pope Francis offered a particular welcome to the delegation from the NATO Defense College, which is located in Rome and which hosts major international events as the premier academic institution of the Treaty Organization. 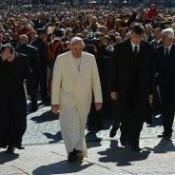 Pope Francis will lead the Holy Week liturgies and devotions in Rome, including the traditional Chrism Mass on Holy Thursday morning, the Missa in coena Domini at the Centro Santa Maria della Provvidenza – “Our Lady of Providence” – home for the elderly and disabled on Thursday evening, the Passion service with the veneration of the Cross on Good Friday afternoon, and the Way of the Cross on Good Friday evening at the Colosseum in Rome, and the culminating celebration of the Sacred Triduum – the Easter Vigil Mass – in St Peter’s Basilica, on the night between Holy Saturday and Easter Sunday morning, when he will also give the traditional urbi et orbi blessing following Mass.